What follows is a design for biofiltration that was developed and promulgated by the Department of Permitting Services, Water Resources Section, County of Mongomery, Maryland, USA. 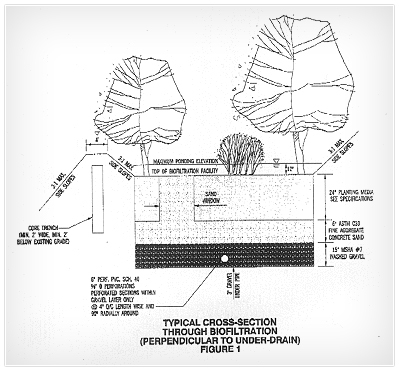 The biofiltration methods described in the following section are based on the bioretention design found in the Maryland Stormwater Design Manuel, and where deemed appropriate, have been modified by the Montgomery County Department of Permitting Services. DPS currently restricts the use of biofiltration (BF) for the treatment of the water quality volume from catchment areas of 1.0 acre or less. In addition, unless waived by DPS all biofiltration devices shall include a PVC pipe underdrain system. a 150 mm thick sand layer, and a perforated PVC pipe underdrainage within a 400 mm thick gravel bed. The entire system can generally fit into a relatively confined space, thus making it well suited for incorporation within parking lot designs. It is strongly recommended that stormwater runoff sheet flow through a grass filter strip into the ponding area. A maximum 300 mm deep ponding depth has been selected so as to reduce the likelihood of creating saturated-soil/anoxic conditions within the system. The perforated PVC pipe underdrain system provides proper drainage and aeration of the planting soil filter layer. Volumes above the water quality volume will pass through the facility via a structural overflow. Excess runoff that cannot be filtered is diverted away from the biofiltration area via a graded grassed swale or similarly acceptable drainage technique. The biofiltration device is appropriate for drainage areas of I acre or less, such as parking lots and building additions in highly visible areas. Large biofiltration structures can be expensive to properly landscape and maintain. The facility must be sized to provide storage for the required water quality volume, Peak flows from the 10-year frequency storm must be safely conveyed around the basin whenever possible. See Montgomery County Flow Splitting Criteria. In general, the BF system cannot be located where the water table is within 2 meter of the ground surface. In situations where groundwater is encountered, another method for water quality treatment should be considered. This design calls for a 600 mm Planting Media placed on top of a 150 mm layer of fine aggregate concrete sand that is on top of a 400 mm layer of #7 washed gravel. There is also a "sand window" that goes up through the planing media to facilitate greater infiltration during heavy rainfalls. The same design but pictured at 90 degrees from the above picture. The facility must be sized to store the required water quality volume (WQV). As previously indicated, the maximum ponding depth above the filter bed area is 400 mm. The facility shall be constructed to a 225 mm depth to allow for settlement. Storage is computed above the surface of the facility. The top of the filter media must be level across its entire surface. Storage volume is determined from the top of the planting media to the crest of the outlet weir or invert of the flow splitter overflow pipe, whichever is lower. Note: Biofiltration devices should not be located in areas where the water table is within 2 m of the ground surface, within areas which contain mature trees or other environmentally sensitive site features, or where existing slopes exceed 15 percent. Pretreatment through a grass filter is preferred whenever possible. Pretreating runoff may extend the life of the facility. A typical location for the pre-treatment grass filter strip or swale is along the back portion of the facility, adjacent to the planting media. Maximum velocities into the grass filter may not exceed 1 m/s. Particular care must also be taken to prevent erosion of the surface mulch layer. DPS recommends that maximum design storm velocities across the filter bed area not exceed 0,3 m/s. An overflow weir may not be required where a minimum of 0,3 m of freeboard is provided above the 10-year water surface elevation in the facility. If an overflow weir is necessary, it can be similar to a small emergency spillway and must be located at existing ground level or in cut. If the facility is not fed by a flow-splitter, size the weir to safely pass the full 10-year storm. If the facility is fed by a flow-splitter, outlet weir sizes may be reduced, with the outlet weir sized to safely pass whatever portion of the 10-year storm is delivered to the facility. In this case, protection may be provided by permanent turf reinforcement matting only. Utilization of turf reinforcement matting should be considered wherever stream thermal concerns are an issue. Individualized designs to safely pass either a flow-split 0 or the 10-year storm, both with 0,3 m of freeboard, are necessary. Provide a safe non-erosive outlet below the outfall. The underdrain pipe consists of 150 mm diameter schedule 40 or stronger perforated PVC pipe at 0.00% slope. The underdrain pipe will be placed within the gravel layer. 80 mm of gravel must be placed under the pipe, with a minimum of 150 mm of gravel over the pipe. Perforations must be 10 mm in diameter and must be located 100 mm on center, every 90 degrees around the pipe. Perforated pipe must begin at least 1500 mm inside the filter media. Filter fabric must not be wrapped around the underdrain pipe. Access for cleaning all underdrain piping is needed. Clean-outs for each pipe should extend 150 mm above the top of the planting media and have a removable waterproof cap. Thus, the requirement will be for two underdrain pipes, each 4,5 m long. 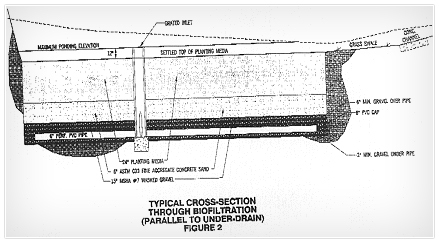 Underdrain pipes should be placed a minimum of 1,5 m apart. The gravel layer surrounding the underdrain pipe(s) must meet MSHA size #7 (Table 901A), and must provide a minimum of 150 mm cover over the pipe(s), and minimum 80 mm under the pipe. No geotextile or filter fabric is allowed anywhere within the filter media (stone and sand). A minimum 150 mm fine aggregate sand layer shall be provided below the soil filter/planting media. A sand window shall extend from the sand filter to the surface of the planting media opposite from the inflow point. (figure 1). The sand window will be a minimum of 1 m 2. ASTM C33 Fine Aggregate Concrete Sand is required. Manufactured sand or stone dust is not acceptable. Drawdown time must be designed to be between 12-24 hours. This will allow the facility to be free to treat consecutive storms, while increasing the treatment time to provide for adequate pollutant removal. Drawdown computations must be submitted to DPS for review. A removable, watertight perforated underdrain cap (25 mm minimum opening) may be used to achieve the drawdown requirement. The perforation must be at the invert elevation of the underdrain pipe. In thermally sensitive watersheds, a 12-hour drawdown time must be used. The planting media shall consist of 1/3 perlite, 1/3 compost and 1/3 topsoil . The perlite shall be type 0560. The compost shall be high-grade compost free of stones and partially composted woody material. The soil shall meet the following minimum criteria: contain no more than 10% clay, 30 - 55% silt and 35 - 60% sand. The soil shall be free of stones, stumps, roots or other similar objects larger than 50 mm. 'The first layer of the planting media shall be lightly tilled to mix it into the sand layer, so not to create a definitive boundary. The planting material shall be flooded after placement . Any settlement that occurs shall be filled back to the design elevation. The mulch layer is an important part of the BF. Much of the pollutant removal capacity of the BF is within the mulch layer. The surface mulch layer will consist of standard fine shredded aged hardwood mulch. The mulch should be applied uniformly to a depth of 50-80 mm. Yearly replenishing may be necessary. Pine bark is not acceptable. Plants, through their pollutant uptake and evapotranspiration of stormwater runoff, play a key role in the overall effectiveness of the biofiltration device. Both the number and type of tree and shrub plantings for the system may vary, especially where aesthetics or other considerations are critical to site development. While native plants are encouraged, they are not always appropriate in all situations. While no hard planting rule exists, the plants should be a mix of trees, shrubs and herbaceous materials. However, there should be 2 to 3 shrubs planted per tree and herbaceous plantings shall make up 40 % of the total number of plants. Trees shall be a minimum of 2 % in. caliper, shrubs shall be minimum 2 gal. size and herbaceous plants shall be a minimum 1 gal size. Mature plant canopy should cover 85 % of the BF. A landscape plan will be required as part of the plan. The plan will be sealed by a registered landscape architect. Since the plants are an integral part of the BE, no changes to the approved landscape plan will be allowed without prior approval from DPS. An 85% survival rate after 18 months will be required before the as built plan is approved.